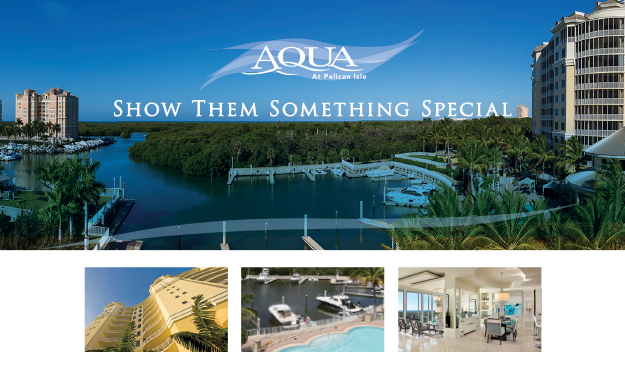 In a town living the finest of coastal luxury, AQUA gives your high-end clientele something special. With immediate access to our marina, Wiggins Bay and the Gulf of Mexico are open for exploration. Or take a quiet day by the resort-style pool, a sunset from the rooftop sky lounge and a movie in the private cinema. For the adventurous or the relaxed, there’s a home at AQUA. AQUA gives your clientele world-class amenities with the flavor of modern lifestyle trends. Behind the breathtaking water views and Door-to-Dock Lifestyle is an artfully designed residence and the unique charm of Downtown Naples. Give your clients the best of everything they want. call (239) 591-2727 or visit us online.